It’s our version of chilled somen noodles. This recipe is vegan, gluten-free, soy-free, and perfect for a hot summer day. This dish consists of three basic components: noodles, broth, and garnishes. 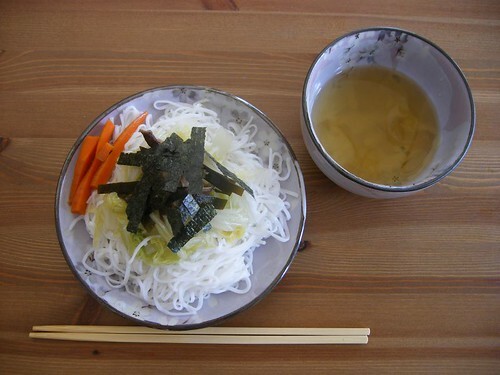 Traditional somen noodles are made from wheat, so I substituted rice noodles. Annie Chun’s Pad Thai noodles turned out to be the perfect width and texture. Rinse shiitake mushrooms and kombu lightly under running water. Add shiitake mushrooms, kombu, and carrots to water in a pot. Bring to boil. Let simmer for 15-20 minutes or until ingredients are very tender. Remove from heat. When broth is no longer steaming, remove shiitake mushrooms, kombu, and carrots from the liquid and set aside to cool. On a plate, arrange the chilled noodles with the garnishes you’ve chosen (except for the shredded sushi seaweed, grated daikon radish, and Shiso Fumi Furikake, which are best added directly to the broth just before eating). Serve 1/2 cup or so of chilled broth in a small bowl. This is one of my favorite summertime dishes. It’s healthy, refreshing, and as a bonus, the broth is rich in vitamins and minerals such as iodine and potassium. * Made in a larger quantity and used hot, this is the same broth used for udon or soba noodles. ** These three ingredients can alternately be used as sushi fillings for another meal. Two birds, one stone!